Dave Mains passed away at the age of 48 on Monday, June 25th. “It is with deepest sorrow we notify our members and community of the terrible loss in our family. David Mains has passed away from injuries sustained in a crash in Massachusetts. Jen Mains is injured and expected to recover in the Massachusetts hospital. Captain Mains was a dedicated member who loved his family, community and this department. 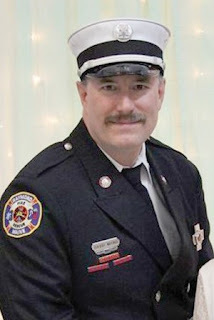 He will be sorely missed and will leave a large void in our family and organization which will not be filled without unmatched extraordinary efforts, pride and dedication which Captain Mains put forth every day. Captain Mains has been honored as Firefighter of the Year, awarded many community service awards and honored with the Chief’s Award.